When these sets were first announced, this figure was known as "Flashback T-800," not just plain "T-800." 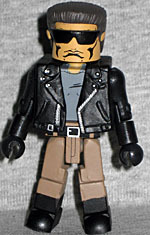 And that makes sense, since while this is a Terminator 2 line of toys, this is clearly a Terminator 1 design. He has the brown pants, the distinctive leather jacket, everything (you can recognize it by the silver zippers and snaps painted expertly on it). How could Art Asylum do this, when NECA had to secure an entirely different license in order to make their T1 figures? Well, we're guessing AA cheated a little bit. There's a scene in T2 where we see surveillance photographs of the Terminator attacking the police station in the first film. Those weren't actual stills from the original movie, but instead re-creations shot specifically for the sequel. Thus, the costume details are probably fair game: this absolutely appeared in the movie they had the rights to. But not everything appeared. The figure comes with a second, interchangeable hairpiece, since his sunglasses are attached to the one he's wearing in the packaging. The toy wears the glasses for the same reason the Terminator wore them: to hide his exposed robotic eye. The Schwarzenegger likeness is excellent, but that eye wasn't seen in T2, so it's kind of skirting the issue. 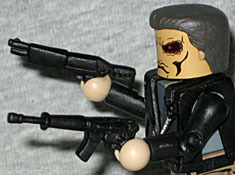 In addition to the hair, the T-800 includes two guns - the same two guns as NECA's Police Station Assault figure. So basically, Minimatized versions of the AR-18 assault rifle and SPAS-12 shotgun. He's also got a pair of ungloved hands that are much paler than the skin on his face. I suppose the second figure in this set is technically the same character, but since T-800s are an entire line of robots, not the designation for one specific copy, it doesn't have to be. The Endoskeleton really doesn't work very well as a Minimate: it's too complex for the simple block style. The hands and feet are new sculpts, to make them look appropriately mechanical, and while it works okay there, the way the torso and hips are similarly built-up is too much (due in no small part to the fact that the shoulders end up being wider than the arms are). 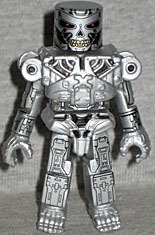 If you want a skinnier Endoskeleton, you can take the chest cap and "metal diaper" off him, which actually helps a lot. The torso is molded from clear plastic, then given silver and black decos - this allows them to fake the pistons that help hold up his torso, but "clear plastic" and "light gray plastic" look so much alike that the effect kind of gets lost when we're dealing with silver paint. The torso, arms and legs are all covered with thin black lines to denote the construction of the mechanical body, but the crotch is plain silver, so even if you strip the endo down that won't look right with the rest of the body. The Endoskeleton gets a weapon of its own: a Westinghouse M95A1 Phased Plasma Rifle. This pegs the Endo as definitely being from T2, since while Arnie asked the gun store owner for such a weapon in the first film, one was never seen; it was only in the future scenes of the sequel that we saw Terminators wielding them. The M95A1 was built on the Calico M960 9mm submachine gun, but you'd never know it from looking. The "Flashback" T-800 is a fine figure, but nothing special. The Endoskeleton is disappointing, no matter how you look at it. This is a set you can skip, unless you're feeling like a completist. 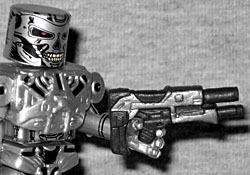 This entry was posted in Art Asylum, MMMR and tagged Minimates, Terminator. Bookmark the permalink.